I wrote a post last year which featured my favourite surf photo from each month of 2016. This year I’m going to spread it out a bit and write one post for each month. February was a little harder to choose than January, I had three photos on my shortlist. This is not the best surf photo I took in February, but it’s my favourite. It represents a trip to the Basque country with a bunch of friends. This was taken at 8:56am on the promenade in front of Zurriola beach in San Sebastian. I was on my way to the petrol station to buy some pastries for breakfast. I don’t think we surfed this day, we walked up to the top of the hill between the two beaches in the town and chilled out before heading off that night to a local Cideria. 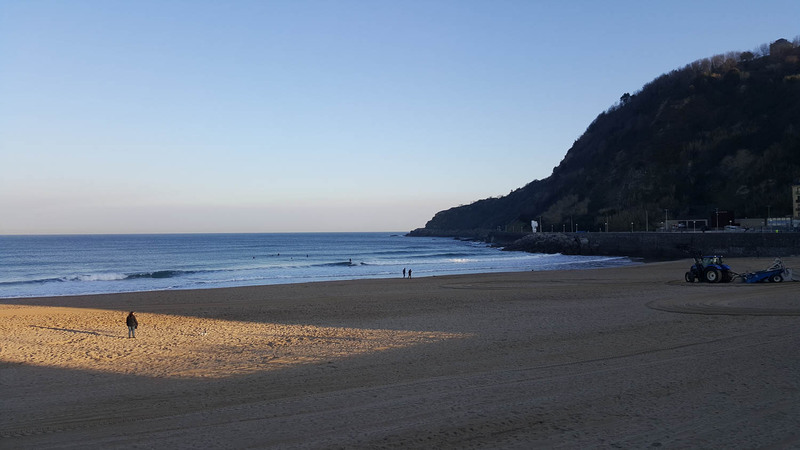 If you’re in San Sebastian you should definitely check one of these places out – you get to try dozens of different local ciders and eat a nice meal in a great atmosphere. This photo was to show the rest of the people with me what the surf looked like. I waited for an average set and until someone was surfing a wave. I didn’t think about the composition beyond trying to get it level and getting the lineup into the middle of the photo. Assessed the conditions: It’s glassy, small and cloudless, perfect for a pulled back shot that includes the unique environment of a city beach. That’s all hypothetical, because I went back to the AirBnB, put the pastries in the kitchen and got straight back into bed to sleep off my hangover. Coming soon – my favourite surf photo from March, I’ll make sure it’s an action shot this time.